SALT LAKE CITY (AP) Sedrick Barefield can throw up points in bunches, but when to do so will be the key for the Utah guard. The Utes will need him to make the right decision on a regular basis after losing four starters from the 2016-17 team. The 6-foot-2, 190-pound guard scored 18 in his debut last season after transferring from SMU. Five days later, he dropped 35 on San Francisco. It was immediately clear that Barefield could score, but he eventually settled into a reserve role and finished the season averaging 9.0 points per game. He now has a fluid role as a combo guard that will be called upon to score at times and set up teammates at others. Barefield and Long Beach State transfer Justin Bibbins are expected start in the backcourt and share the point guard responsibilities. Collette, who praised Barefield’s work ethic, is the leading returning scorer after posting 13.6 points per game last season. The Utes have lost 45.7 points per game from four starters last season. Barefield will have more opportunities this season, but must have balance. Consistency is what coach Larry Krystkowiak is looking for from Barefield. From the wild swings in offensive production to defensive effort, the seventh-year coach wants more balance from those with increasing roles. Krystkowiak acknowledged Barefield had an uphill battle last season after NCAA rules wouldn’t allow him to play until December. Barefield spent the offseason focused on being under control, taking care of the ball and making the right play. He said he’s quicker and has better handles than last year. The Corona, California, native is looking forward to the added responsibility and the freedom to play more aggressively. Utah is going to need all of that if it wants to improve on an 11-7 Pac-12 record and a first-round loss in the NIT after winning at least one NCAA Tournament game the previous two seasons. GONE: The Utes said goodbye to four of their top six scorers from last season, including Lakers first-round pick Kyle Kuzma. Lorenzo Bonam graduated and Kuzma left early. Devon Daniels and JoJo Zamora transferred out of the program with a combined 16.8 points and 46 starts. YOUTH MOVEMENT: The Utes have at least five first- or second-year players that have the opportunity to play a significant role. Sophomore Jayce Johnson should be more active after the 7-foot sophomore played all 32 games last season, but averaged just 4.0 points, 4.3 rebounds and 0.6 blocks per game. Redshirt freshman Chris Seeley and freshmen Donnie Tillman and Christian Popoola will also have the chance to earn big minutes. 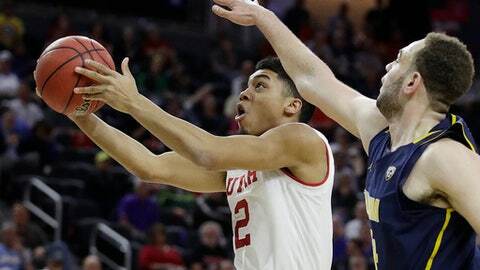 SHARPSHOOTER: The Utes would love for Parker Van Dyke to improve his outside shooting. He was third on the team last season with 86 attempts, but connected on just 34.9 percent. The 6-foot-3 junior was coming off a two-year Mormon mission last year, so there was an adjustment period. Utah ranked No. 8 in the Pac-12 with a 35.3 3-point percentage in 2016-17. ADEPT ON D: No one knows what to truly expect on the offensive end with so many new faces in bigger roles. Krystkowiak has always been a defensive-minded coach, but that becomes even more important when there are question marks on the other end. A camp focus has been transition defense, limiting easy baskets and defensive rebounding. Utah ranked No. 4 in the Pac-12 in scoring defense (68.1 points per game) last season and No. 3 in defensive field goal percentage (41.7).